Mystery Lovers' Kitchen: Is it time for a party? This month I am celebrating several things including an Agatha nomination for my short story "So Much in Common", the arrival of my author’s copies of The Busy Woman’s Guide to Murder: a Charlotte Adams mystery and a birthday. What better time to make a night of it? A dinner party would be perfect. However, experience tells me that the dinner parties where I am comfortable and relaxed are the most fun for my guests. To make sure this happens, I like easy, reliable dishes that can be prepared ahead and cooked at the last minute. Here’s one of my favorites. It’s been a hit at parties chez Maffini since I discovered it. Of course, like all of you, I like to make a few modifications to suit my creative urges. One of the things that I love about this chicken is the tantalizing aroma as it bakes. The cranberries and thyme combine with the ricotta and the crispy chicken skin to make your guests mouths water while waiting for dinner. Combine cheese, cranberries, bread crumbs, egg, time and seasonings in a bowl. Make a 2 – 3 inch slit on the side of each chicken breast, deep enough to put filling. Stuff 3 or 4 tablespoons of the filling into each chicken breast. You can prepare the recipe to this point and refrigerate the chicken until an hour before you plan to serve it. Heat the oil and butter in a non-stick pan and brown the top of the chicken breasts. Transfer to a baking dish lined with aluminum foil. I use a jelly roll pan. Bake for 45 minutes or until cooked through. Don’t overbake! It will smell wonderful while cooking. If there's any left over, it will be great - hot or cold - the next day. What's your favorite party dish? Or easy side dish? 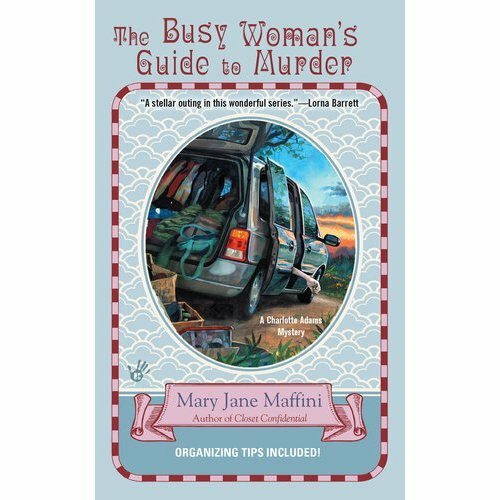 April 5th will launch The Busy Woman's Guide to Murder. In her fifth outing, Charlotte Adams is offering time management tips while solving a crime and righting some old injustices. Charlotte says, "Forget about doing things right. Concentrate on doing the right things." I think I'll cook her something nice! For contests, more recipes, news and tips, sign up for my e-newsletter at detect@rogers.com! I'd love to stay in touch. I am so excited about this recipe, MJ. Can't wait to try it. Looks delicious and different -- something you'd find at an upscale restaurant. I just love food that's good for company! Thanks! Oops, hit "post" before I was actually done. I hope you like the results, Julie. I always get asked for the recipe. And thanks for the congrats too. You deserve many yourself for your nominations and wins this past two years! Thank you for a wonderful recipe, MJ. This baby has some of my very fave ingredients (esp. the ricotta)! I like the idea of stuffing the breasts, too, and your step-by-step photos make it an even easier prospect. BIG CONGRATS on your well-deserved Agatha nomination, too. I also love the title of your new Charlotte Adams mystery. THE BUSY WOMAN'S GUIDE TO MURDER sounds like my life (on a day without coffee :)), and I can't wait to read it. Thank you, Cleo! I knew you'd appreciate the ricotta part. I loved your cranberry chicken recipe a while back. This has an entirely different taste. It guess those two ingredients just go together. Who knew? MJ - Lol, and I forgot to wish you a HAPPY BIRTHDAY!!! Thank you! I will have a cake recipe to follow (even though I won't be making my own). My dinner party go-to is my potato-pinto enchilada bake (recipe on here somewhere!). That with a light green salad with jicama, tomato, and a chili/lime vinaigrette. Like you said, the key is something make-ahead and easy, so you can enjoy your company (and toasting all your fabulous news!). Thanks, Wendy! I remember the enchilada bake! I added it to my To Make file because it had a lot of my favorite foods in it. I will try it at the cottage in the summer when we have a ravenous gang. This is my kind of recipe, MJ! I have a ton of company coming in the next weeks, and this just went on the menu! Thanks! And congratulations on your Agatha nomination. So very exciting! Always looking for new chicken recipes & this looks so yummy! Thanks. My easiest side dish is the one I buy at the deli. Congrats on the nomination & the birthday -- wishing you many days of celebrating! Thanks, Krista and Erika. I hope it works for your gang, Krista. I know you always have fabulous food for them. And Erika, your side dishes can fool me. I am always a happy guest at your place! Oh, yum, yum, yum. The filling looks delish, and you know how I like cheese in anything. :) What a fun dish. Congrats on your nomination! What a lovely honor. I do know that, Avery! I love cheese in anything too and I think of you every time I make something cheesy and delicious. Speaking of congrats, you are nominated for the Agatha for best first novel and that is really exciting! This looks like the perfect chicken to have when we have a few friends over! Thanks so much, MJ!